Jesus is in the middle of a riff on repentance in today's Sunday Gospel. He focuses on the importance of Israel, God's people, recognizing their need for a savior lest they experience the judgment of God. In doing so he relays a parable about an unfruitful fig tree, a tree that in the estimation of its owner has been given more than enough time. 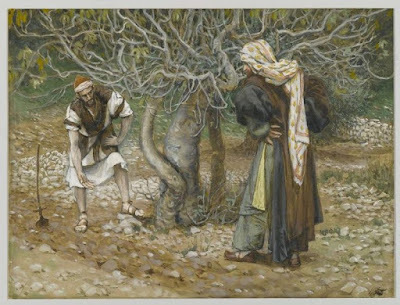 But rather than cut it down, Jesus tells us of a gracious vinedresser who intercedes for the tree saying, "Sir, let it alone for one more year, until I dig around it and put manure on it." It may seem insignificant but this one sentence from Jesus is an essential reminder to how God does his most important, yet often painfully slow, work of changing lives. When examining these words, most people immediately jump to the verbs, to the action. The vinedresser, Jesus, wants to dig and fertilize. In relational terms we could think of this as the essential components of truth and love. To bring about change, God tills the soil of our hearts and minds with his truth -- ripping out the weeds of lies and the old roots of sin and making way for good things to be planted. He then adds in the fertilizer, or in real terms love, the truth of the Gospel and the promise of his unrelenting compassion in Christ, which serves to enrich our soil, begins to take root and spurs on new growth. Life change takes truth and love.